Our egg graders are manufactured using very sophisticated materials and technologies. Accurate and detailed planning has allowed the engineering and the manufacture of highly reliable and updated equipment from a technological point of view. 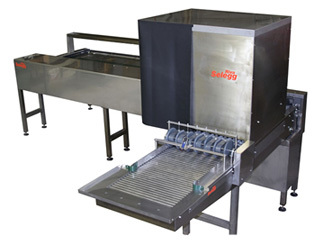 Furthermore these egg graders are very easy to operate and require very simple maintenance. 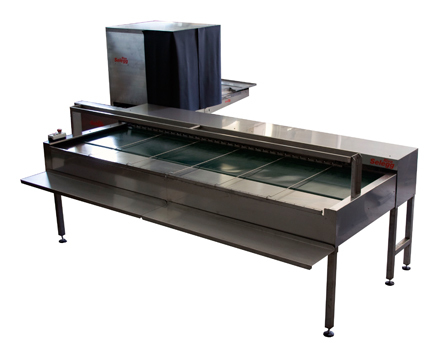 – In-line feeding conveyor for the direct supply from the belt coming from the cages, complete with automatic egg pressure control. – In-feeding with 6 rows of rubber rollers, candling booth with 6 fluorescent lamps, egg’s rotating motion to simplify candling. – Grades in 6 classes with 30 precisely scales. – Synthetic belt to transport the eggs from the scales to the hand packing table. Adjustable dividing lathes for all grades. – Electric power 400 Volts 3phase, 50 Hz. 1,1 Kw. Hand vacuum lifter (5×6) for in-line feeding conveyor’s semi-automatic loading. 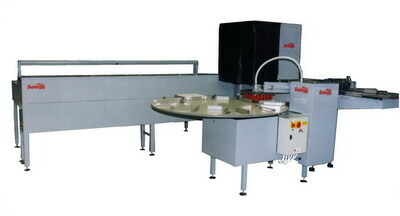 Automatic vacuum loader with round table for 8 trays. The vacuum lifter loads 30 eggs. Egg counter on the in-feeding. Pre-stamping device to stamp the eggs before weighing.